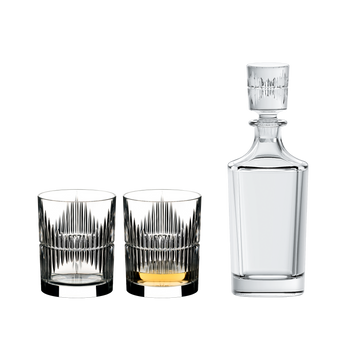 This set contains 2 pieces RIEDEL Barware Tumbler Collection Shadows Tumbler and 1 piece Whisky Decanter Shadows. Ideal to give as gift or to enjoy yourself. The decanter with stopper is ideal to store spirits in an elegant way. The two matching tumblers let you enjoy spirits at its best. The decorated, machine-made whisky set of the stylish, yet subtly nostalgic glass collection RIEDEL Barware Tumbler Collection is inspired by the glamorous Art Nouveau period and presents a contrast to Riedel’s purist, unadorned wine glasses. RIEDEL’s Barware tumbler collection presents perfect, ‘must have’ glasses for all cocktail and spirits lovers. All RIEDEL glasses are dishwasher safe.